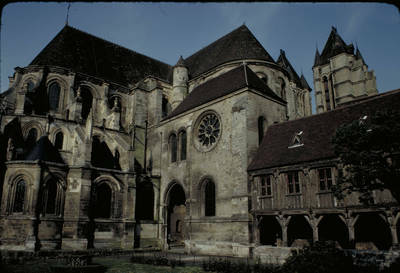 Noyon Cathedral, north transept and choir with half-timbered building (chapter library) c. 1500, 1131-1230, Early and Late Gothic architecture, France. Note also the late 12th century treasury chamber with the rose window off the south transept. With thanks to Henri Ferudy, Christopher Crockett, and James Bugslag for the preceding information.